Your website is your company’s face in the digital world. It’s the first thing a potential or returning customer sees when researching your product, and it is the first step that will build goodwill and trust (or the opposite) in a customer. You don’t want to scrimp when it comes to investing in your site, and the first step should be ensuring it’s responsive. 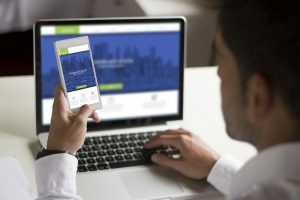 Here is what you need to know about the importance of responsive auto dealer websites and why you need to embrace responsiveness. Ten years ago, making a website was easy: You made it work for a desktop and that was it. But when Apple released the iPhone, it completely transformed the way people access the internet. Now, practically everyone has a smartphone in their pocket that gives them access to the World Wide Web. This shift meant websites needed to consider how they looked on a phone, which is a very different viewing experience (consider the portrait versus landscape layout of a phone versus a desktop). People realized quickly regular websites were difficult to view and navigate on their phones. This led to the creation of “mobile-friendly” sites—websites that structured their content differently and made surfing by phone an enjoyable experience. The stats are in, and you need a mobile-friendly website keep customers on your site. The next evolution of the mobile-friendly site was the responsive website. These are designs implemented into websites that make every page and all its content attractive and convenient to use on all devices. Whereas mobile-friendly targets smartphones specifically, a responsive website looks great on any device as people jump back and forth from phone, to tablet, to laptop, and finally to desktop. So, when you search an auto dealer website on your lunch break on your phone, then send the link to your partner who views in on a desktop, you’re both seeing the same site and it looks great on both devices. Responsive auto dealer websites are more expensive, but this is an investment you should make. You can no longer assume a user will see your site on a desktop; in 2016, more users accessed the web from mobile devices than desktops. If you want to ensure visitors stay on your website, the user experience must be great regardless of the devices they are on. Consider your lot traffic, too. Though online purchasing of vehicles is on the rise, most people are still likely to visit your dealership before making a final purchase. That means customers may have started their research on the desktop at home, but then hit the road to actually visit lots. They emailed themselves a list of links to the cars they’re interested in, which they’ll pull up when they’re on the lot. For automotive dealerships especially, creating responsive sites can be difficult. These sites, due to their flexible nature, often need to be pared down when it comes to visuals and content. But for automotive dealers, that’s not always an option. People expect a certain level of aesthetics from a car dealership, as well as a wealth of helpful features, such as comparative tools, video, high-quality pictures, and detailed product information. That leaves responsive auto dealer websites walking a tightrope between the desired features customers expect to see and a responsive structure that’s clean and usable. It’s no simple task, but it’s an important one. Fortunately, there are experts who can help. Make yours one of the best responsive auto dealer websites. Your customers will appreciate and use your site, ultimately meaning more traffic and revenue for your dealership.